The screenshot above is hosted and provided by cadkas.com. Please contact them directly for any copyright infringement as we are not responsible for that content. Limitations: The demo version add the words "Demo version" to every page. Have you lost the password to remove the pdf encryption? Now you can not print or copy the content of your own pdf file? No problem! 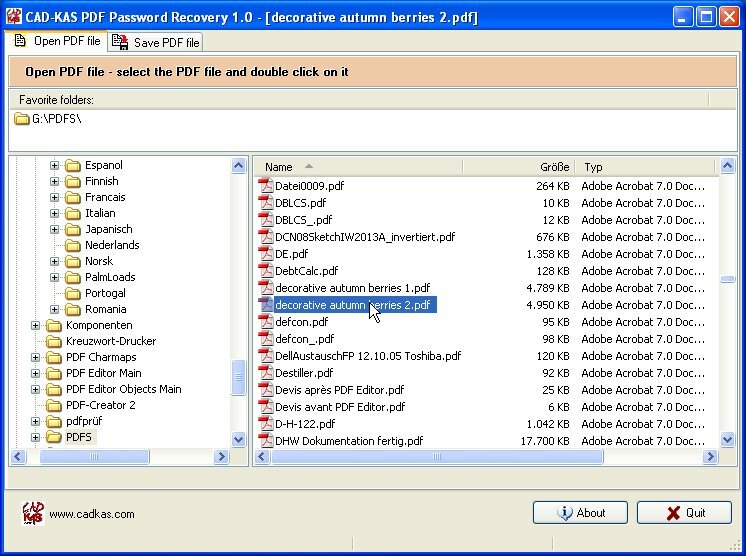 With PDF Password Recovery you can remove the password with one mouse click! PDF Password Recovery can remove the pdf encryption for any pdf file where only an owner password has been specified. All pdf files which you can open and view in your PDF reader can be decrypted.The program also supports the AES encryption with 128 and 256 bits. The program can decrypt any file which you can view in a pdf viewer instantly and remove any restrictions.